Join us tonight for MAKEnight! 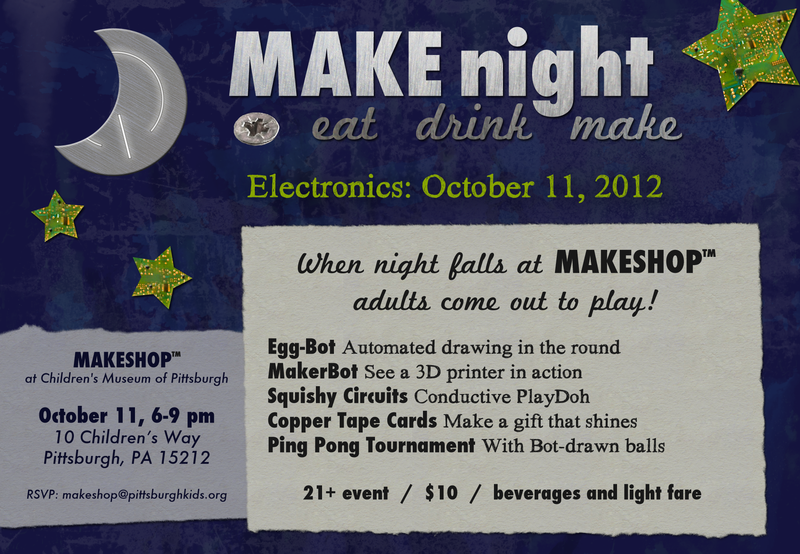 This Thursday, October 11, 2012 from 6 – 9 pm, MAKESHOP™ will host our first after hours event, MAKEnight. It is our hope to provide a cultural evening where adults can get together (without the kids!) and explore DIY processes centered around the theme of electronics. You don’t have to know about electronics to come! All ages are welcome and no prior making experience is necessary. Whether you are wanting a fun night out with friends, looking for a new venue for date night, or just feel like geeking out at a Children’s Museum, we hope you’ll come! Please note that this is a 21 + event. $10 gets you drinks, snacks, and materials.